If you have children then you know how hard it is to come up with new and fun ways to help them entertain themselves. One thing I have tried before has been kids craft kits with varying degrees of success. So, I was very intrigued to find these earth friendly kids craft kits. 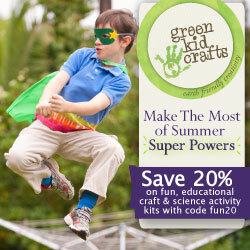 These kits from Green Kid Crafts are available as a subscription model and have several time commitments and levels all with 20% off right now. All of their boxes are made of recycled materials and the craft supplies included are sourced to be the most eco friendly on the market. In addition the kits contain sustainable crafts and activities that spark creativity, build confidence and cultivate respect and love for the environment.